Mixing it up. 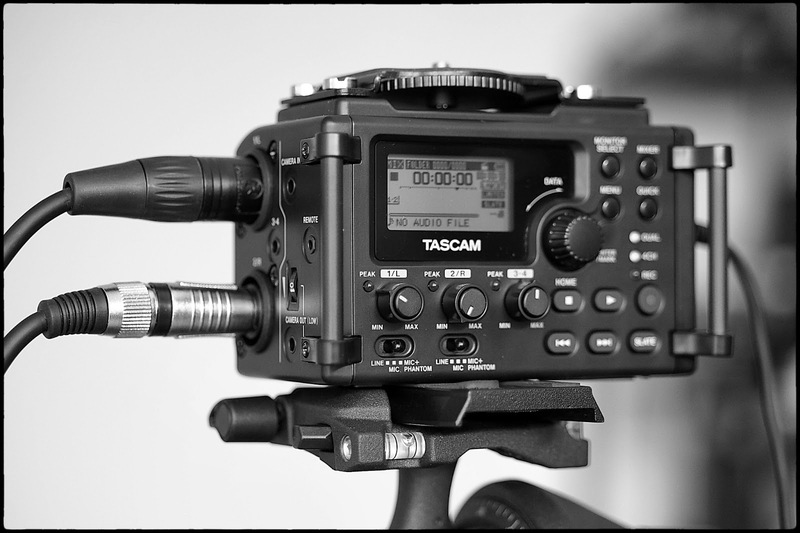 A Tascam Digital Audio Recorder enters service at the VSL studio. And beyond. Of the 60+ projects we undertook in 2015 about eight of them were video assignments. Just video with no still photography component. 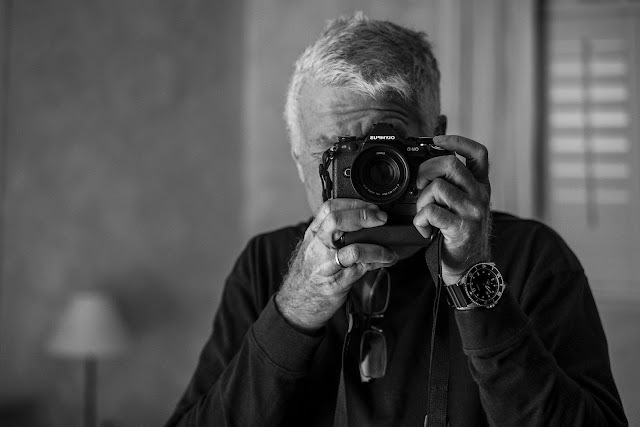 I shot them either on a Nikon D750 or D810 in the earlier part of the year and then tossed the Olympus EM5.2 cameras into the mix in the second half of the year. All of the video projects worked out pretty well so I have a reasonable expectation that we'll continue to see growth in this area in 2016. While the ratio between still and video jobs seems large it's good to remember that video has more "moving parts" takes longer to complete and comes, almost automatically, with more billable hours. Bonus if you can also write scripts! One tool that I kept missing for video production was a good set of preamplifiers to use with various microphones. Some microphones, when used directly into the cameras, have some electrical and level mismatches that cause problems with noise. We have a passive Beachtek unit that allows me to moderate levels and to use microphones that require XLR connectors but I didn't have an elegant way to really match the microphones to the cameras when I needed to boost lower signals. I have a Zoom HN4 that works well but the levels are not controlled by discreet, physical knobs and it's a barebones solution for getting decent audio. My work around is to find a USB auxiliary batter unit with an internal, rechargeable battery to plug into the USB slot. Either that or find an endless supply of batteries. A small price to pay for microphone preamplifiers with less noise that those in my older Zoom HN4. I like this unit for the way I work, which, as you may have guessed, is a bit eccentric. I am partial to a set of inexpensive, Audio-Technica, hardwired lavaliere microphones. Specifically, the Pro 70 model which is a cardioid condenser model that handles voice very well. Yes, I do have a set of Sennheiser wireless microphones but for some strange reason I like the security and visual presence of dedicated wires. Go figure. The only issue I've had with the Pro 70's is that they do not put out a very big signal. 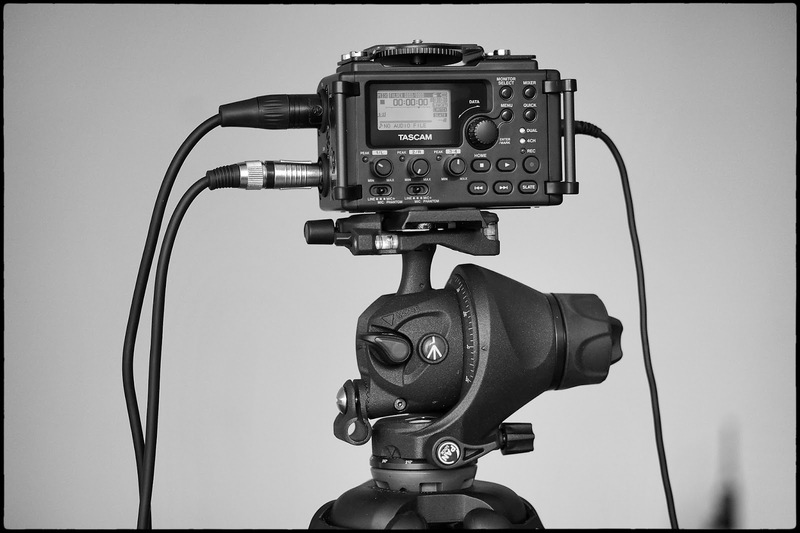 If they are plugged into the Beachtek D2A or directly into the camera they require a lot of gain and, with camera pre-amps, that means a lot of noise and hiss. 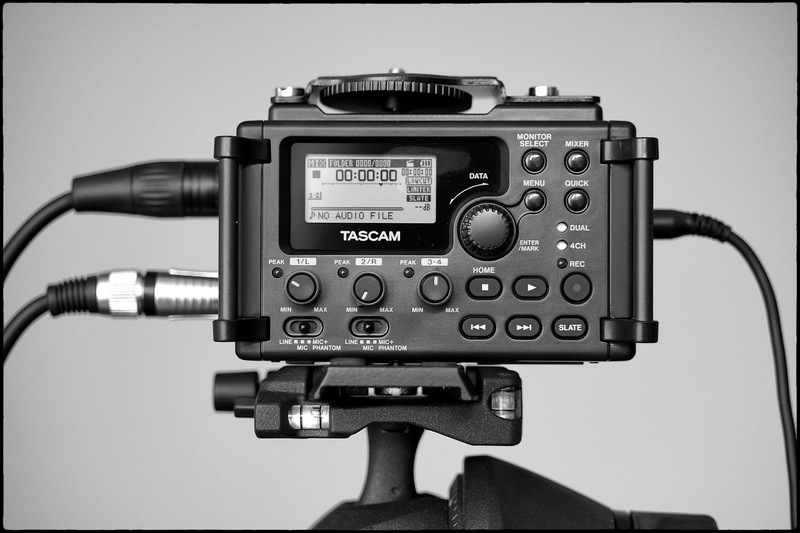 The Tascam DR-60 version 2 has four master levels of gain as well as the front mounted knobs that allow one to "ride the signal" as necessary. At the second highest gain setting in the master menu the microphones just come alive and the DR-60 keeps the noise to a much, much lower level than my cameras. The other advantage is that with all my cameras gain control of external (and internal) microphones calls for "menu diving" and menu control, as opposed to external, physical controls. There are some other nice features like being able to bring a signal back out of the camera in order to monitor what is being written (sound-wise) to the internal memory cards of the camera. I also like the "slate" button that allows me to generate a tone with which to set the initial camera levels in manual. Once set I don't have to use the camera controls to ride audio; I can use the physical knobs on the Tascam digital audio recorder to do so, and have a certain level of assurance that I won't overload the camera. The unit also has a feature which will record one set of tracks at regular levels and one set of tracks at a level about 20 db down. This means that if someone starts shouting into their microphones and overloads the normal audio tracks we have a quieter second track to fall back on. That's nice. I'm certain that there are better built units all over the market. This one has a plastic battery compartment door, for example. But I'm equally sure that this unit is an amazing bargain for people who are careful not to use their gear to hammer nails into walls or use their audio units gaffer taped to skateboards, etc. Why am I writing about this unit here? Because, like it or not, we're going to be doing more and more video along with our still photography and I think people are interested in how we make our video productions work for the mid-tier projects we keep taking on. Last words, Nagra and Sound Devices are the two most professional producers of this kind of product and have equivalent products (at much higher build standards and with much cleaner audio) that sell for between two and three thousand dollars each. If you want a nice, eight channel Nagra you can spend between nine and eleven thousand dollars. 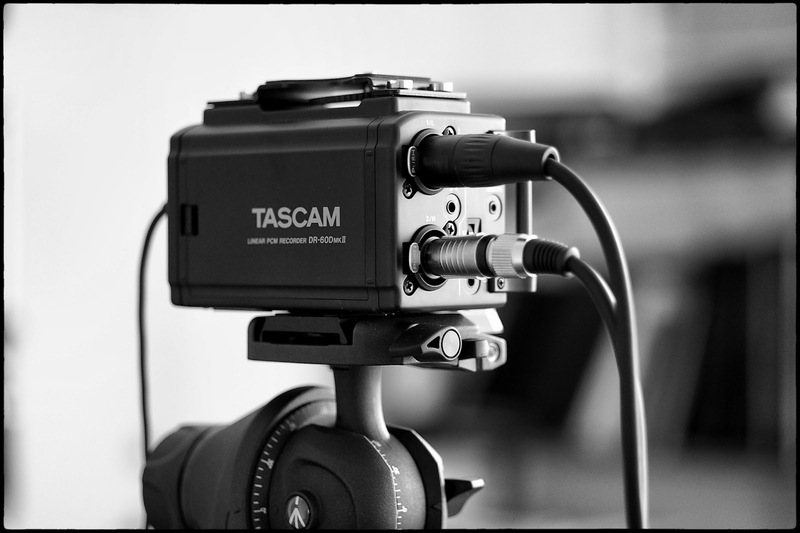 I paid less than $200 for the Tascam and it already sounds (to my ears) at least twice as good as anything I was getting directly into the cameras. Seems like a good choice for me. YMMV, depending upon your needs. And your budgets. Marking the beginning of a New Year with a collection of self-portraits with camera. Or are they really just portraits of my camera? Welcome to my year of Narcissism. Starting out the New Year right. A nice walk with a good camera. The images just above and just below are window displays at one of Austin's rare book stores; this one over on 12th St. 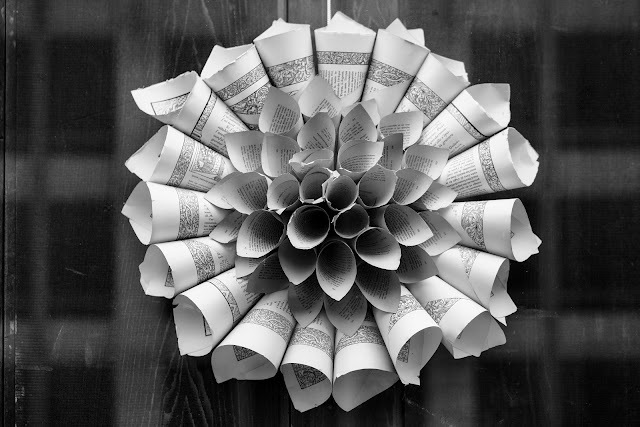 I had never seen a wreath made from manuscripts before and I found the effect intriguing and attractive. They made for very topical holiday displays. I shot the images yesterday, on the first day of 2016. There is something really wonderful about walking on your own, with a camera over your shoulder, and no real agenda. 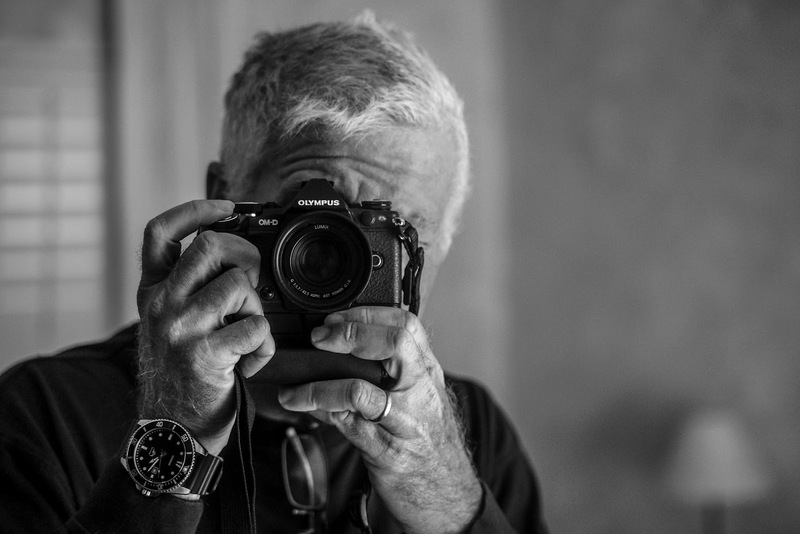 The camera represents the potential to capture and share images but, if you are relaxed about it, the presence of the camera doesn't have to mandate that you shoot a little, a lot, or anything at all. On its own the process of walking is healthy and allows you the mental space to think and turn over concepts, conflicts or ideas with ease. When I go out for walks with friends there are just two goals; one is the sharing of good conversation and ideas, and the other is to get some exercise. I never bring along a camera when walking with a friend. It would create a disconnection for one or the other of us. If I saw something I wanted to photograph I'd have to break the continuity of the conversation; the flow of the exchange, and switch gears into my design/photography mental space. Then, once the photograph was taken, I would have to switch gears back into the social relationship. This doesn't mean I don't value the walks with other people but I treat them differently than I do when I'm walking alone. By the same token I would never bring along an active cellphone when having a meal at a nice restaurant, with friends. I can't think of much ruder behavior than stopping a conversation over dinner to look at a text message or answer a call. Since I was walking by myself I was able to plot a new course without having to build a consensus, or check in with a walking partner. I parked in my usual place, by the Treaty Oak, about a block from the downtown Whole Foods store, and walked north instead of my usual east/west route. 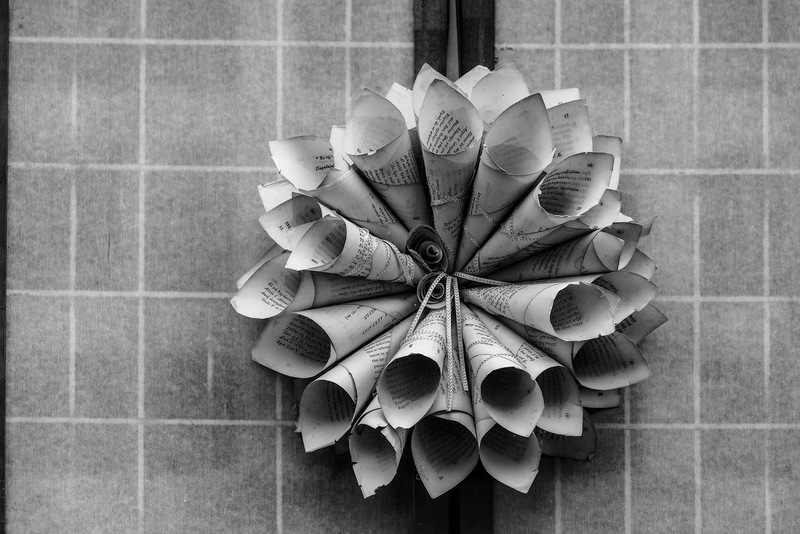 I cut up to 12th St. (where I saw these paper wreaths) and headed to the state capital where I witnessed a small band very armed people demonstrating in favor of the new open carry law in Texas. I headed all the way south on Congress Ave., over the river to Barton Springs Rd. before heading west and back to my car. It was cold and blustery yesterday. 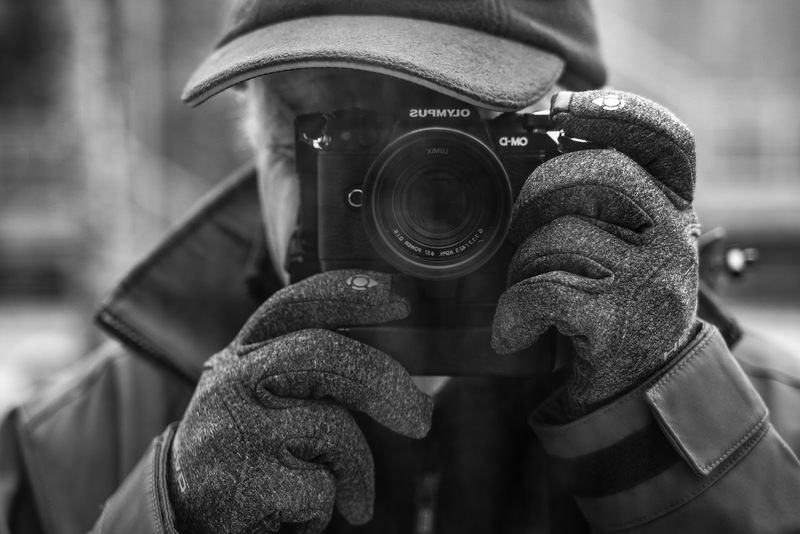 My warm jacket felt great and my mid-weight gloves were a good match for the smaller buttons on my camera of choice. 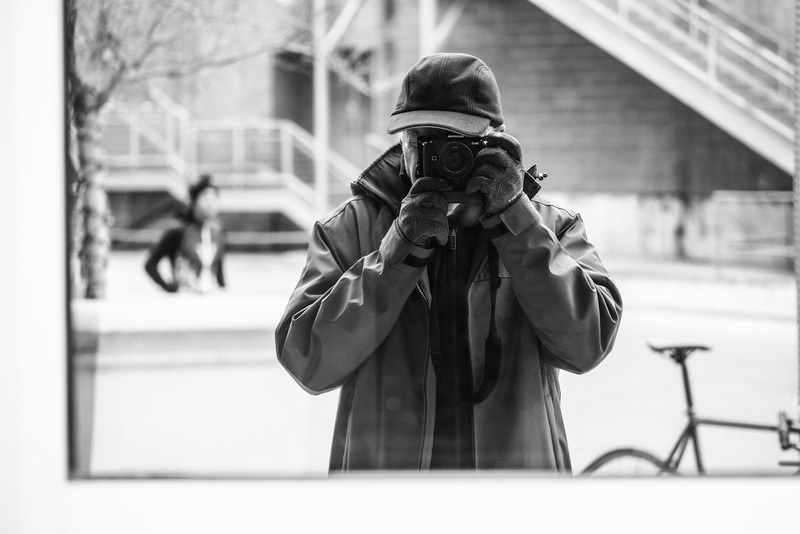 I was "open carrying" an Olympus OMD EM5-2 with the newly updated firmware. I chose to use a Panasonic 42.5mm 1.7 lens for the whole walk. No gear choices to make. The one extra decision I did make was to shoot entirely in black and white for the whole day. 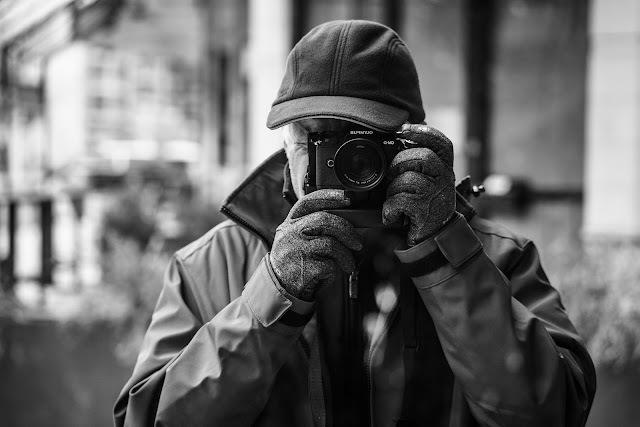 It reminded me of my early adventures in photography when I would carefully husband a 36 exposure roll of Kodak's Tri-X film for days at a time. I mentioned the updated firmware and I wanted to share my experiences with you about the update. I did one camera first and then put the newly upgraded camera next to the one that had not yet been upgraded to I could easily match my old settings. The upgrading process throws away your settings! Having a "reference" camera was a quick way to resolve any selection decisions that might have been unclear. Both upgrades went without a hitch. There was one bit of user knuckle-headedness though. One camera had the new, flat video profile greyed out in the menu. I was unable to set it. I was getting very frustrated and I again put both cameras (now both upgraded) side by side to see what might be different between the one which allowed the setting of the flat profile and the one that did not. I found the difference pretty quickly, I had one camera set up to shoot monochrome while the other one was set up in the "natural" profile setting. The one with the color setting had no issues selecting the new profile in the "i" menu. As soon as I shifted out of monochrome the second camera was also able to use the new profile. I guess that's the kind of detail that slips between the cracks when Olympus goes to write about the new changes in camera operation caused by firmware updates. 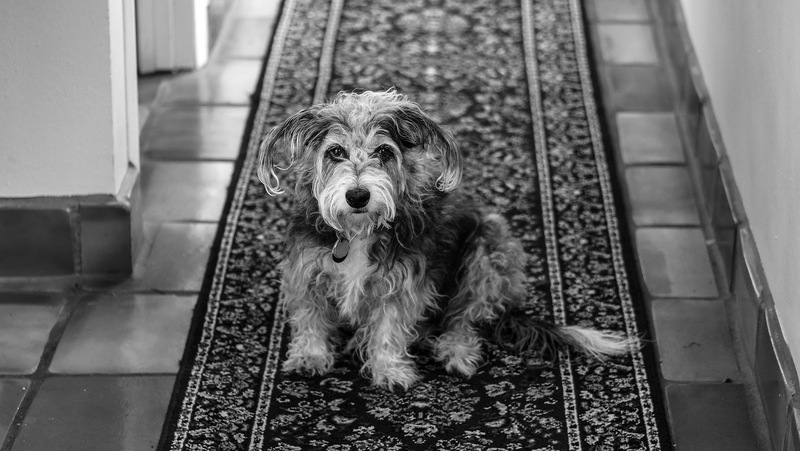 I have been shooting more and more work in black and white with the Olympus cameras. 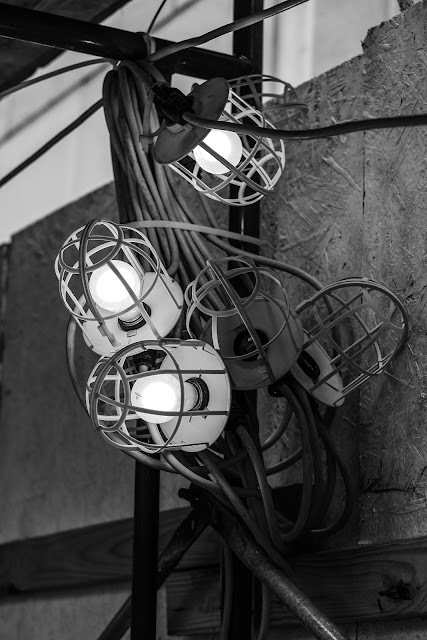 They make it fun and easy to do, and it's very cool to see monochrome in the EVF. I've also enjoyed looking at the finished work --- black and white is different. It harkens back to a different age of photography but at the same time it's so graphic and represents a more distilled design sensibility. I'll work on shooting more and more of it this year. The combination of the black and white feedback; via the EVF, the great image stabilization, and the perfect focal length made my first fun and friendly shoot of the year a happy occasion. More like this. When I got home I was confronted by Studio Dog who told me, in her own delightful way, that the weather was not fit for man nor beast and questioned my sanity in the leaving the safety of the pack, and the warm house, for some adventure; the likes of which didn't not even pay off in tasty meat or other treats. Chastened, I slunk into the studio to process my take. I ran both cameras through their paces this morning and haven't found any "deal killing" hidden, scary secrets with the firmware upgrades. I like the flat profile for video very much for video and actually wish I could use it for stills. It's very nicely done. I have one resolution for 2016: Have more fun taking photographs. That's it. Happy New Year!